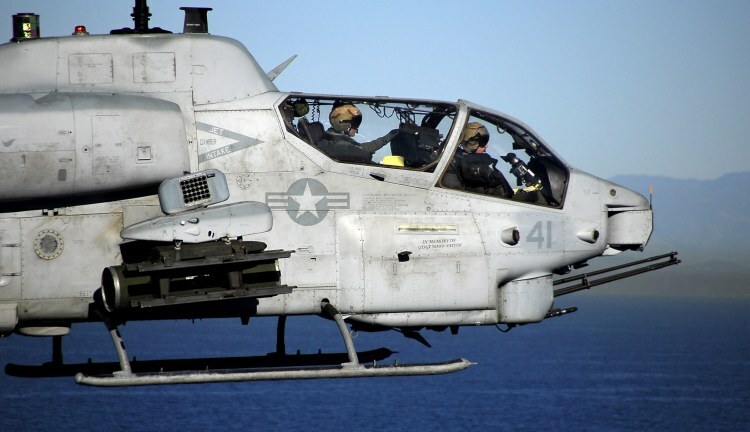 Pacific Ocean, 07 November 2008 — An AH-1 Cobra attack helicopter pilot and weapons controller assigned to Marine Medium Helicopter Squadron 163 (REIN) approach amphibious assault ship USS Boxer (LHD 4). Boxer is conducting a composite training unit exercise preparing for a regularly scheduled deployment early next year. U.S. Navy Photo by Mass Communication Specialist 3rd Class Daniel Barker.